The industrial-modern trend is still in demand. 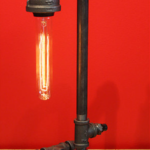 Those who love the factory-inspired, nostalgia-driven trend should check out new Minneapolis-based brand Populuxe, which manufactures its own line of industrial Edison-inspired lamps with vintage-style bulbs. Founded by David Shannon, an artist and designer with nearly two decades of experience in corporate graphic design, Populuxe also sells more than 30 varieties of retro soda and Shannon’s original “retro-constructivist” posters and prints. The brand has a store and workshop in the Northrup King Building in Northeast Minneapolis, where it’s open to the public two days a week. 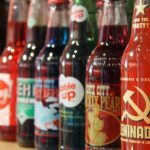 Local vintage soda connoisseurs may be familiar with Shannon’s previous brand, SodaShak, which he founded about six years ago while making paintings and posters out of his former studio in the Northrup King Building. 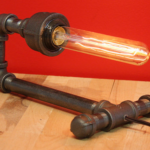 He decided to rebrand as Populuxe about six months ago, when he began creating his industrial lamps. 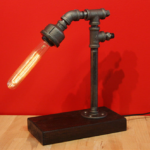 Shannon was an industrial design major in college with an emphasis on furniture and toy design, and had created lamps as part of his classwork. “I went back to my roots,” he says. Back in the 1950s, the term populuxe was used to describe popular luxury, which included elements from the space age, futurism, and mid-century modern design—something that Shannon felt fit his aesthetic and product selection perfectly. (Plus, he points out, “lux” is the Latin word for light, and “pop” nods to his retro soda-pop.) Using elements from this era as well as the industrial age, and a heavy dose of nostalgia, Populuxe was born. 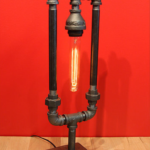 Unlike other industrial-lamp makers who use salvaged, vintage materials, Shannon crafts his lamps with wholesale, new materials he sources online, including a body of industrial black steel pipe. This way, he is able to offer a consistent product. He sells six made-to-order models on his website and at his studio, and he also accepts custom orders. Lamps range in price from $125 to $250. 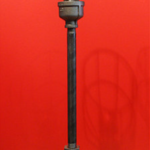 You can see the lamps in person during Populuxe’s open hours every Wednesday and Friday from 10 a.m. to 5 p.m., or during the upcoming Art-A-Whirl open studio weekend on May 18 to 20 (Friday from 5–10 p.m., Saturday from noon–8 p.m., and Sunday from noon–5 p.m.), or shop online at pop-u-luxe.com.